Solid shampoo bars using cold process soapmaking techniques but formulated with hair loving oils, butters and additives have been some of my most popular items over the past few years. People love the convenience and sulfate-free features of these shampoo bars and at times it can be hard to keep up with the demand. They are however, not for everyone. The naturally higher pH of these alkaline bars are great for deep yet gentle cleansing and softening of the hair, but not appropriate for all hair types or water conditions. Hard water is especially difficult for these type of shampoo bars oftentimes needing an acid rinse (diluted apple cider vinegar being the most common one used due to its availability at your local grocery store) to help remove hard water residue and maintain pH balance in the hair. Following up your shampoo with a conditioner can also help restore the pH balance but not deal with hard water rinsing issues. So, in order to offer more variety and choices for those who still want a sulfate-free shampoo but are unable to use these shampoo bars, I have developed and am introducing a new line of shampoos using sulfate free and gentle surfactants (surface active agent). Surfactants are compounds that lower the surface tension between a liquid and a solid. They are what bind the dirt and sebum (solids) from our hair and skin to water (liquid) to allow those solids to easily rinse away during use. True soap (created from the saponification of oils with lye) is also a surfactant. There are however, chemically derived surfactants that are more suited to different hair and skin types and water conditions. Just like with anything else, there are a variety of these surfactants to choose from - some are very harsh detergents that can irritate and strip your hair and skin of much needed natural oils and many others that are very gentle and reduce the irritation factor of the finished product. Just like with formulating my soaps, choosing the surfactants to use based on what they bring to the finished product is the same as choosing which oils to use when formulating a bar of soap - those choices matter in the finished product. Introducing a new liquid shampoo formulation suitable for all hair types in two scents (Fresh Clean and Bamboo Grapefruit) and 2 new solid shampoo bars - one for normal to dry hair and one for normal to oily hair - both in the Fresh Clean scent. The liquid shampoos are currently available in both my Etsy Shop and my online Website. The solid shampoo bars will be available in January 2015. The new liquid shampoo offers gentle cleansing for all hair types in all water conditions plus it adds mild conditioning and moisturizing benefits. It is currently available in two unisex scents. The new solid bar shampoos also offer concentrated gentle cleansing, mild conditioning and moisturizing properties in a convenient and long lasting solid bar. Two bars will be available for different hair types that will work beautifully in all water conditions. 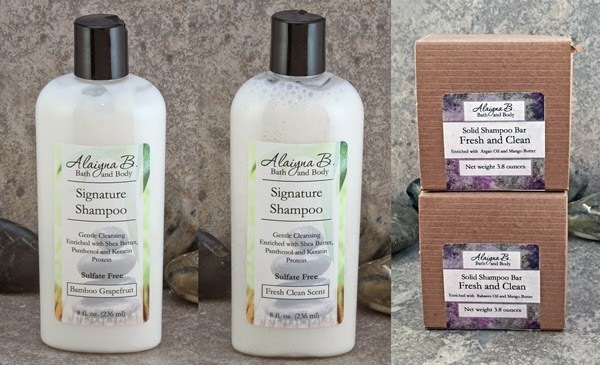 Again, these are sulfate free shampoos to gently clean and nourish your hair. Brief summary of ingredients used in the various formulations. Not all ingredients are used in all formulations. Sodium Cocoyl Isethionate - An extremely, gentle surfactant based on coconut fatty acids. It is exceptionally mild for skin, hair, and eyes, and is tolerant of hard water. Creates a nice foam and leaves behind a luxurious silky feel. Perfect for all hair types. Cocamidopropyl Betaine - Organic compound derived from coconut oil. Another very mild cleanser (surfactant) with good foaming properties. Reduces harshness making final product very mild and gentle. Great for sensitive skin and scalp. Sodium Methyl Cocoyl Taurate - This is a very mild, moisturizing cleanser suitable for dry to normal hair types that is derived from coconuts. Excellent lathering properties and very tolerant of hard water. Disodium Laureth Sulfosuccinate - A natural source surfactant that is derived fom natural vegetable oils. It is non-irritating and will not strip skin or hair of natural oils. Leaves skin and hair feeling soft and conditioned after rinse off. Excellent degreaser makes it a great addition for oily hair. Sodium Lauryl Sulfoacetate - A great alternative to Sodium Lauryl Sulfate. Derived from coconut and palm oils, and conforms to Ecocert's natural and organic cosmetic standards. Non irritating, rich lather that is extremely mild and gentle. Panthenol (Pro-Vitamin B5) - Moisturizer, improvement of hair structure, may add luster and shine. Polyquaternium 7 - Conditioner, moisturizer and detangler. Helps with wet combing. Hydrolyzed Proteins (Keratin, Wheat, Silk) - Moisturizers and film formers to coat the hair to protect and add shine. Some proteins add body and volume to hair. Strengthens. Guar Hydroxypropyltrimonium Chloride - Conditioner and thickener. Preservatives - Keeps water containing products from developing bacteria, yeast, mold and fungi.